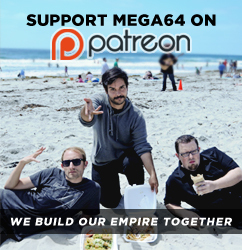 MEGA64 PODCAST 100TH EPISODE EXTRAVAGANZA!! At LONG LAST, the Mega64 Podcast has hit episode 100! This internet MILESTONE had to be celebrated with what may be the most memorable, poignant podcast yet. Words cannot suffice- it can only be experienced. Watch below or subscribe to the left. Audio version here. Next week's podcast will be our first official live broadcast! The Mega64 Podcast Episode 101 will go live this Sunday at 7PM Pacific (10 eastern) right here at Ustream.tv! It'll go on iTunes later, as always. Come back in the next few days for more stuff!